The majority of consumers who take to the marketplace to purchase one of Apple’s mobile devices, such as an iPhone or iPad, are typically looking to enjoy the spoils brought to the table by the company’s iOS platform. After all, most average consumers simply want to purchase a device, and use it as the manufacturer intended with additional functionality installed through apps uploaded onto the App Store. However, there is a small minority that loves to tinker with hardware, including those who love to install additional, non-sanctioned software onto specific hardware, such as an iPhone 7 user in this video showing off the device emulating Microsoft’s Windows XP operating system. If you take one Apple iPhone 7, the latest download of Apple’s Xcode integrated development environment, a copy of Windows XP, the Bochs x86 emulator, and add that together with a little bit of enthusiasm and technical tinkering, you end up with an iOS 10.2.1 device offering up an emulated Windows XP experience. 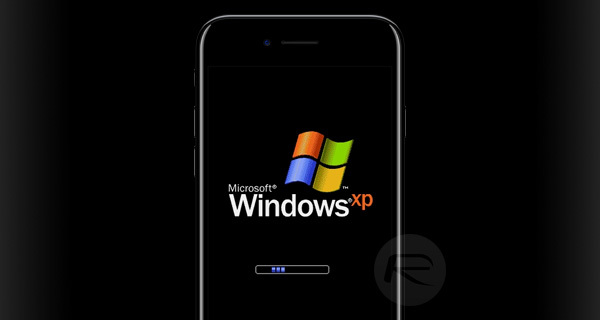 It’s definitely impressive to see the familiar-looking Windows XP boot logo showing up on the beautiful iPhone 7 display, but it’s fair to suggest that it isn’t exactly offering up the level of experience that Microsoft would have wanted when XP was built and distributed to the general public. If you can exercise the patience required for the emulated Windows XP to actually load up on the iPhone 7, then you will find yourself presented with the Windows XP desktop, complete with the taskbar and familiar-looking Start button that acts as the central point of navigation. Navigation is mapped across to the iPhone’s touchscreen, meaning that the mouse cursor can be controlled with gestures and swipes on the display. There are also very simple touch gestures which can be used to select options, as highlighted by selecting the Start button to bring up the “Administrator” menu. It’s actually extremely exciting to see the small little display of the iPhone 7 used to open up iconic parts of the Windows XP operating system. Those looking to get in on the action can check out the GitHub page here to get started. As with most emulated hardware that we’ve seen on mobile devices, it’s extremely slow to load, extremely slow to use, and definitely doesn’t provide a friendly user-experience, but let’s be honest, this is Windows XP running on an iPhone 7, which is fairly amazing. Hahah that’s amazing! I can’t wait to have something run this faster, I’d be able to play OldSchool Runescape on my iPhone then! Haha dream come true. Windows XP to this day is still my favorite lightweight OS. It’s sad it’s not supported anymore. Only needs like 150MB of ram to function well. Best OS ever. I mean you can sort of already do it with Remote Desktop clients on your iPhone. But I get that since it is installed native, it is quite a feat. I would wanna install Elder scrolls V skyrim and try it out, maybe they will implement more ram or video card into iphone next time..
waste of time….why xp why not new beta windows 10 LOL…. I’m not sure Redmond Pie understands the word “hacked”. This is an emulation. Nothing was “hacked”. Yeah, because this is a finished product that would be put on the market to sell, so we should judge it as such. I’m sure it’s not just someone tinkering just to see if it could be done. Not hacked. Dumb. So dumb. It wasn’t HACKED to run WinXP. It’s just an emulator. There’s a non JB version as well.